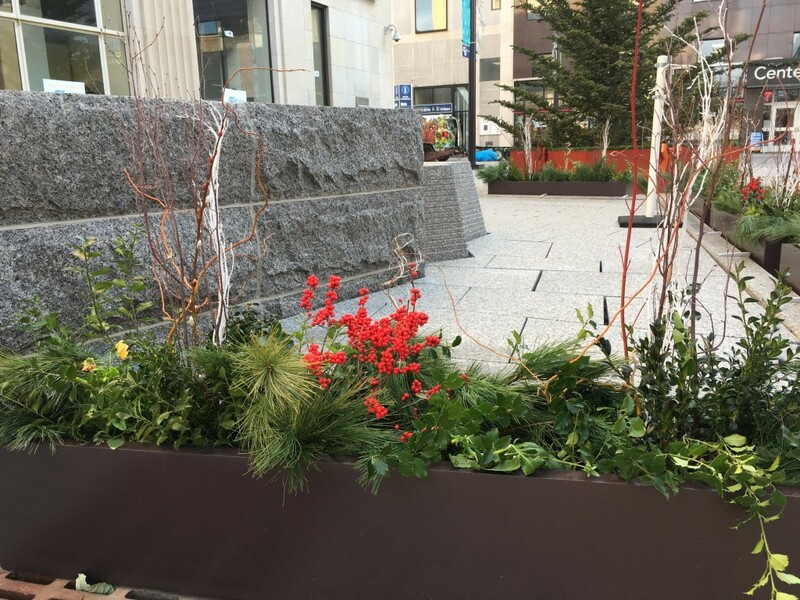 Once again, the Tompkins County Community Beautification Program has transformed the planters on the Commons—this time with winter decorations. The 78 moveable planters, scattered throughout the Commons, are now filled with evergreens plus bunches of natural and white birch, curly willow and others. Festive notes are added with locally grown winterberry holly and sparkly curls. The newest addition—the six new containers by the fountain, first planted this fall with ornamental kale and pansies—now boast shiny green holly branches, white birch, eucalyptus, cattails, giant pinecones and more. The moveable planters, as well as eight inground plantings, are planted and maintained by the Tompkins County Community Beautification Program and Downtown Ithaca Alliance, with the assistance of dozens of volunteers known as the Beautification Brigade. The planters are replanted four times a year, following the seasons. The summer plantings, in particular, have been spectacular, featuring tall tropical cannas with colorful sweet potato vines and petunias cascading down the front. The program is administered by Cornell Cooperative Extension of Tompkins County and funded by the Tompkins County Tourism Program.